I had heard about this easy roast from my sister in law, so I finally decided to give it a shot. The result was amazing, and really it doesn't get much more simple than two ingredients, yes two! We have had shredded pork burritos, pork nachos, and pork sandwiches this week. I still have pork left, but I think I will freeze the rest otherwise my family might get a bit burned out if I serve shredded pork for every supper this week! Place roast in slow cooker and dump the jar of pepper rings over the roast. Cook on low for 8-10 hours. I had a giant 7 lb roast, so it took the entire 10 hours. Products that are considered staples in our house! 100 Calorie Guacamole Minis: I thought I was the only one addicted to these delightful things. However, I noticed they kept disappearing and I knew my kids weren't eating them. Well, low and behold I caught the husband snacking on these after work one day. He said it was the perfect amount so he didn't eat too much before supper, and you know what?...He's right (we won't tell him I said that!)! 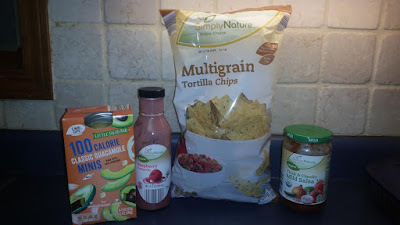 Of course I use the multigrain tortilla chips or carrot sticks to dip with. I also use these during the year in my lunch to spread on my wraps as well or for dipping. Simply Nature Raspberry Vinaigrette Dressing: If you can still find this one, consider yourself lucky! This dressing has become my absolute favorite, especially with summertime salads. My latest go to salad has been baby spinach topped with tomatoes, blueberries, and slivered almonds and a tablespoon (or more) of this deliciousness! 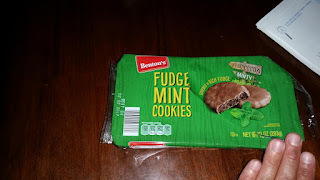 Fudge Mint Cookies....aka Girl Scout Thin Mints Darn you, Aldi! I had mentally prepared myself prior to entering Aldi that I was going to eat healthy this week and not snack on my kiddos' junk food. I was doing so well the first two aisles of this shopping endeavor, then I spotted these wonderful cookies! I thought, hmm I wonder if those taste anything like the Girl Scout cookies? Mind you it was 2:30 in the afternoon so I was getting a bit hungry, and I'm pretty sure the conversation in my mind went something like this, "I will grab them and see if the kids like them (yeah right!)! Maybe I will eat a couple on the way home from the store since I am kind of hungry." Well, Aldi has done it again, these cookies are fabulous! Notice the second picture? All those cookies were consumed on the way home from the grocery store by none other than yours truly. That's right, heatless, as in I didn't have to heat up my house by using the oven or stove! This is a big deal when the heat index is well above 100 and the air conditioning seems to be constantly running to keep up! 3 Never Any Chicken Breasts1 pks Ranch seasoning1 or 2 chicken bouillon cubes2 slices Never Any Smoked Bacon1 cup of water Directions: Place Chicken in slow cooker, cover with Ranch, place bacon over the ranch, put bouillon cubes in bottom of slow cooker, pour in water, cook on low for about 8 hours or until chicken is done. Remove chicken from slow cooker and shred. For a Wrap: I like the Fit N Active wraps, any of them. Place shredded chicken in wrap and top with lettuce, tomato, avocado, cucumber, and salsa (this is how I like to prepare mine). Wrap and serve...delish! The title has a story behind it. Whenever Katie and her family come to our house her husband always notices my overly full pantry and fridge of snacks, and says to Katie, "We need more shnaacks!" So I thought today's shnaack post would be perfect. I know when we are heading to the pool I just grab random boxes of whatever is almost empty from the pantry and then I don't have to buy ridiculously priced junk food from the concession stand. We love our Benton's Vanilla Wafer cookies, Savoritz cheese crackers, and Clancy's Pretzels just to name a few!